Frank Peretti and Ted Dekker -- two of the most acclaimed writers of supernatural thrillers -- have joined forces for the first time to craft a story unlike any you've ever read. Enter House -- where you'll find yourself thrown into a killer's deadly game in which the only way to win is to lose... and the only way out is in. 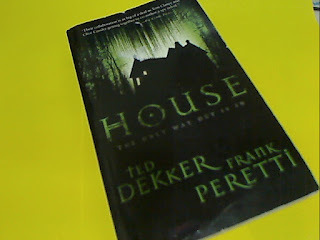 I bought this book because it's a collaboration of two heavy weights in the world of supernatural thriller especially one with Christian messages. It sat on my shelf for a couple of years and for some reason and it was only recently that I decided to 'make an honest book out of it'. :) just playing with words here. I love the cover....dark against an equally sinister and creepy background, it should house within it an equally dark and creepy story. I was right and wrong at the same time. The story was confusingly dark and creepy...confusing because everything just seems to go round and round and I got extremely muddled! It was dark and creepy because there are scary moments and the message....I am not sure I am able to interpret it especially since there's always seems to be some sort of theology message behind books by these two authors. Can Susan be a representation of Christ who doesn't have to be in the world but yet came into the world (i.e. the house) to save those inside it? And the characters and their actions, do they represent the dwellers of the world? Perhaps someone can read and share with me your interpretation of this story?